I grew up in country South Australia, attending Port Lincoln High School before moving to Adelaide for further study, graduating from Flinders University with a BA (Hons) in philosophy and completing a PhD on Hume’s problem of induction at the University of Adelaide. My main interests as a philosophy academic were reasoning in natural language and the philosophy of science, but most of my university career was spent in management at the University of South Australia. I found my philosophical training a good basis for a strong interest in strategic planning, quality assurance and improvement, and human resources. Since leaving UniSA my wife and our dog and cat lived on our boat for some years, and now share an award winning energy efficient home in southern Tasmania. I enjoy making things (though two years of builders’ labouring will be enough to last forever), gardening, walking and sailing, and trying to minimize our ecological footprint without sacrificing the enjoyment of life. 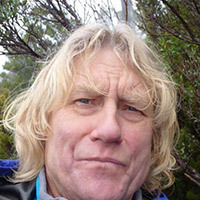 I am an Emeritus Professor of the University of South Australia, and an Adjunct Professor, Division of Deputy Vice Chancellor (Students and Education) University of Tasmania, where I am involved in strengthening community support for education, particularly senior secondary schooling, in all Tasmanian communities.